I admit it: I’ve been complaining about the limitations of Apple’s Front Row software since the day it was released. As enthusiastic as I was about the concept of Front Row, in practice I felt stifled by its limitations. I’ve got an Intel-based Mac mini attached to my TV set at home, and have been able to see Front Row’s strengths and weaknesses at close range. The “bug” Apple’s document is referring to here is the fact that Front Row couldn’t shuffle anywhere but from its main menu, foiling the hopes of people like me, who tend to shuffle within a playlist, artist, or album. Calling this lack of an essential feature a “bug” is stretching it a bit, but it certainly was a limitation. Here’s the good news.. be it a bug or a missing feature, it’s fixed in Front Row 1.2.2. 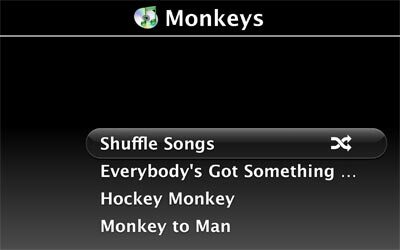 Now shufflers can shuffle their music freely, using only an ample iTunes library and an Apple Remote. Another annoyance of mine, ever since Front Row was first released, was the user-unfriendly warnings the program would display when it was having trouble playing movie trailers streamed from Apple’s web site. Even in the most-recent version of Front Row, playing any movie trailer would cause Front Row to display, in large type, the phrase “Could not connect to the movie trailer server.” Front Row would display that text even if, moments later, the trailer would begin to play without interruption! Aha! And indeed, Front Row no longer complains when you try to play a trailer. Instead, it displays a friendly “Loading Trailer” animation. It’s miles better than what was there before. I can’t speak to the other fixed bugs in Front Row 1.2.2 — improved support for Audible audiobooks, DVD “compatibility issues”, and the like. What I can say is that, with each successive release, Front Row is becoming the product it probably should’ve been all along.